It's hard to imagine today, but originally all there was at Ayia Napa was the 16th century Agia Napa Monastery. Now, Ayia Napa is one of the world's great party destinations, where the clubs are filled with revellers dancing until dawn. It's a non-stop dance zone, where top DJs keep the music pumping until the sun comes up, and the bars and restaurants are filled with fun and chatter 24 hours a day. 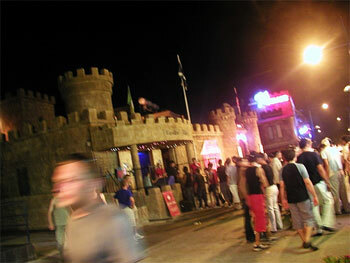 Nightife in Ayia Napa starts no earlier than 10pm, when the bars and clubs start getting full. Actually, Ayia Napa is also a great place for a beach holiday too, with excellent family hotels and golden sands ideal for soaking up the 300 days of sunshine Cyprus enjoys each and every year. What's more, if you tire of the party atmosphere of town, with an Ayia Napa car rental, peace and quiet is just a few minutes' drive away. Ayia Napa car rental is quick and easy with Cyprus-car.com; just book your car hire before you leave for your holiday, and it'll be waiting for you at Larnaca airport. Or, book two or three days' hire during your holiday in Cyprus, and we'll deliver a nippy little car to your hotel or apartment, ideal for finding a quiet beach or picturesque bay. See the steps involved in your car hire bookings. A short drive east of Agia Napa is Cape Gkreko, where you can snorkel or scuba dive in the crystal-clear waters. You can also raise some serious dust racing across the peninsula on a dirt bike! Drive west, and you'll discover the great water sports and golden beaches of Larnaca Bay, overlooked by the picturesque, sleepy villages of the Troodos Mountains foothills. Drive north and you'll reach the famous Green Line border that has divided south and north Cyprus since 1974. Boat trips take you to see the former resort of Varosha, but for better views, drive your Ayia Napa hire car to the village of Deryneia. Sit at the café and you'll have a prime view of the UN observation towers, with the deserted hotels of Varosha beyond.